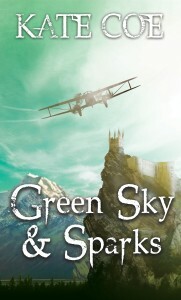 The Green Sky series is a sparkpunk series of novellas about people, technology and magic, set in a world that is just discovering flight and electricity and is trying to balance the use of magic and talent with the new wonders. 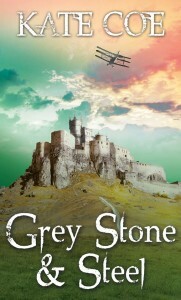 The series is being published by Grimbold Books. There are also short stories available. In a world of magic, wind and electricity, Catter Jeck is offered the chance to explore a myth. Travelling from city to city, his search for the centre of the magic catches others in its coils. 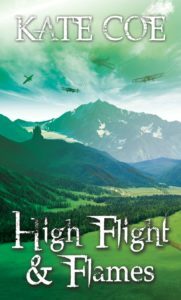 When the Lord Heir of Meton offers to continue the search in his flying machine, the consequences of their subsequent crash – and Toru’s accidental link to a dying Healer – suddenly become of central importance to all of their lives. Now available to buy from Amazon in paperback and Kindle. Toru Idalin, Lord Heir of Meton, has a problem. The man he loves has accidentally made Toru into a powerful Mage, and Toru caused a soul-bond between himself and a grieving Healer. But when Quorl is attacked by an enemy intent on gaining the secret of new-found flight and electricity, the ripples from Catter’s actions become even more important, and Toru is thrown into the struggle to defend both his land and his partner. The land of Quorl is under attack. S’ian, badly injured when her Glider crashed, is trapped in a city under siege; out on the plains, Toru is desperately defending his own city and people from the advancing enemy. The fighting is no longer between men: a battle for the air has started, and new weapons force both sides into desperate measures. Even if Toru succeeds in pushing the enemy back from Meton, what will the cost be? Can Toru reconcile his duty to his country with his own dreams? Mage Obak may be the foremost scholar of Mages’ myths in Taderah, but he is also something of a problem. Dismissed from a mission to find Treloolir due to his arrogant attitude, his life begins to fall apart when his studies are passed to a rival scholar. 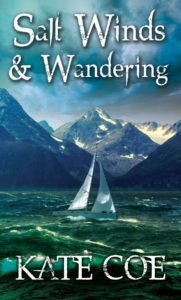 He is sent away to a small coastal village for his health; but although he finds relief from the world in sailing, he still yearns to regain his old life and realises that he may not be able to solve all of his problems. 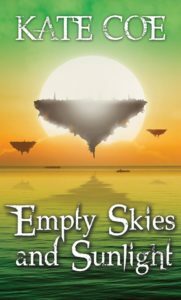 When Anoé Meerla is given the chance to escape a war-torn city with her daughter, she accepts an assignment to find missing people on the beautiful islands of Tao. But she finds more problems than she expected waiting for her; a Floating Island that roams the waves, a Mage trying to forget a war, an old lover with plans of his own, and a tangled web of runaways and murder – and there’s her daughter to protect as well.. This is my NaNoWriMo 2015 project. This was my NaNoWriMo 2014 project. Haller is down and out; left on the streets of Reyan after a mining accident, he makes his living begging and running errands. But his talent for finding rock and strata means he is recruited for a project to run a spark line through the mountains, and he accepts his new role as a surveyor. But even though he would prefer to avoid other humans, they won’t avoid him – and he soon finds that even in the middle of the desert, trouble hasn’t forgotten him. A figure, sitting at a desk. There’s a spark-light overhead; the glass is slightly warped, and it sends odd twists of light across the room. The figure has one headphone on and their chin resting on their hand. The other is holding a pencil, resting on a sheet of paper. They’re listening, waiting for messages to come through. Communication. Morse code. Voice. Sending messages down the wires, under the sea, through the mountains; across the continent, the distance, the ages; from person to person, from mind to mind, and from heart to heart. There’s a secret project being built in Meton; a device that will change the spark system and the world. And Zack Rezian, soldier of fortune and politician’s messenger, has been hired to steal it. It’s a simple job; he’s only got to contend with a frustrated sleeper spy, a deadly archivist, his own political masters and the radical new Lord of Meton…and that’s before he’s even found out anything about the device he’s been hired to steal.